Established in the Middle Ages, this quaint Medieval city was the second largest city in all of Germany, boasting of a population numbering just over a trivial 6,000. Surrounded by a massive stone wall, partly destroyed by the Allied bombings of WWII, hides the quaint city of Rothenburg. The cobblestone streets of Rothenburg beheld the footprints of these vibrant Spring 14 AMBEXers just as it once beheld the footprints of royalty nearly a thousand years ago. AMBEXers pose for a picture while walking the scenic 1.5 mile trek along the fortified stone wall encompassing the city. Here at the Mittelalterliches Kriminalmuseum, Corban University criminal justice major Erica Mulkey reads of the different punishments that were implemented on criminals during Medieval times. 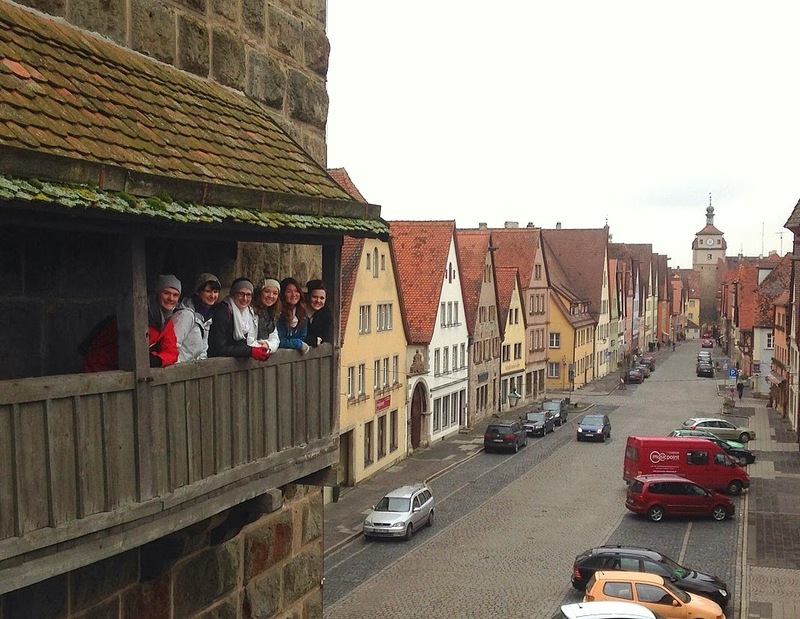 Ambex students share in a laugh and Rothenburg's "famous" desert over a hot cup of coffee in a local shop on this cold winter day. The desert is an over-hyped fried ball of pie crust called a Schneeball (snowball). Despite its irresistible look and smell, students are left incredibly disappointed by its dry, crumbly, tastelessness. From left to right: Chase, Kylee, Kate, David, Tyler, and Taylor. All in all Rothenburg was a well worthwhile day trip excursion. Here students pose for one last picture before leaving this beautiful and historical German city, for some, maybe forever.